This T.D.O.A. RDF set is built into a die-cast Pomona box. I built it in October, 1989. As you can see from the photo, it has held up to lots of abuse as it gets knocked around in my RDF bag. Time Difference of Arrival RDF sets work by switching your receiver between two antennas at a rapid rate. When both antennas are the same distance from the transmitter, the RF phase received by both antennas will be identical. If the two antennas are different distances from the transmitter the RF will have a different phase at each antenna. If we switch between the antennas 500 times a second, this phase change will be detected by an FM receiver as a 500 Hz tone. By turning the antennas for a null in the tone, your two antennas will be perpendicular to the transmitter. Unfortunately, you can be facing the transmitter or facing away from the transmitter and get a null in the tone. By using a synchronous detector and processing the phase of the tone, it is possible to drive a center scale meter to indicate which direction to turn to face the transmitter. When you build this unit you must test it with *your specific receiver. * The audio circuits in a receiver sometimes invert the audio phase and if that is the case, the unit will read opposite of the true direction. If this happens to you simply turn the antenna unit around or reverse the connections to the meter. This circuit is adapted from an idea which originally was described in QST in an article for a Double Ducky direction finder. It uses a CMOS 4066 as a synchronous detector. I used a CMOS 555 as a square wave oscillator to drive both the antenna switching diodes and the synchronous detector. I also added a stage of audio amplification to help drive a less sensitive meter. This unit was originally designed to be mounted directly on the antenna connector of my HT. This worked fine when I originally built it. Today, I have a Yeasu FT50R. It is smaller than the TDOA unit and has an SMA connector for the antenna. Somehow, I don't think it could support the weight. Audio is input via a cable connected to the earphone jack of the HT. 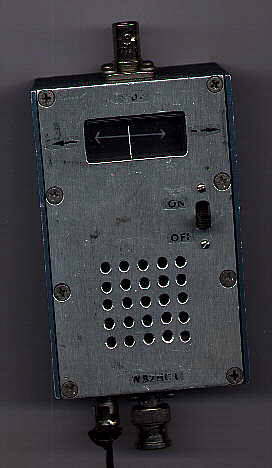 A small loudspeaker was mounted on the front of the T.D.O.A. RDF unit to allow me to hear the FOX. The loudspeaker is not illustrated in the schematic shown here. The T.D.O.A. RDF unit supplies voltage to the antenna unit through the center conductor of the coax. The voltage alternately causes the diodes connected to the antenna elements to conduct. As the diodes conduct, RF is able to flow from one of the antenna elements to the receiver The switching rate is set by the .01uf capacitor and the 47k resistor connected to pin 2 of the 555. If you would like a different tone, try adjusting the value of the 47k resistor. This T.D.O.A. RDF unit uses a center scale meter to indicate which direction to turn in order to face the transmitter. I used a surplus meter movement in my TDOA RDF unit. It was not a center zero meter until I took it apart and moved the mechanical zero adjust lever to make it so. I would guess it was a 100 microamp meter movement originally. I think it was a signal strength meter from an old FM broadcast band receiver. A more sensitive meter would allow you to use less volume. I usually look for a 50 to 200 microamp zero center meter when building one of these units and can usually find a bargain at one of the ham radio flea markets I attend. I never spend more than five dollars for a surplus meter. The meter in this unit cost me about a dollar. I would guess that even a 500 microamp meter could be used. I would be less sensitive and require you to use a bit more volume. I used rub-on transfers (available from Radio Shack) to lay out the PC board in this unit. It does not have the audio amplifier stage which is present on the PC layout included on this web page. The amplifier is needed when using less sensitive meter movements. The PC board layout is shown here looking at the bottom of the board as if you had X-ray eyes and could look through the board and see the parts on top. There is one wire jumper. It is at the lower right side of the PC board. The two transistors are 2N3904 or equivalent. The two diodes across the meter movement are 1N914 or equivalent. The three 25uf capacitors each have two different pads available for their leads. If you can obtain parts small enough to fit the set of pads spaced closer together, use them. There is nothing critical about the value of most of the parts. Anything plus or minus 20 percent of the value indicated will work. (don't add 20% to the 555 or the 4066. I doubt *that* would work!). All of the resistors are 1/4 watt. The two diodes on the PC board are connected "back-to-back" The PC layout illustrates how the diodes should be mounted. The electrolytic caps should be rated for at least 10 volts. (assuming you are going to use a 9 volt battery). The 1.0 microhenry coil used to couple the output from the 555 to the antenna was fashioned by winding about 20 turns of number 22 AWG wire on a 3/16 inch drill bit. It was then slid off of the drill and mounted on the PC board. Details of the antenna are shown below. The four antenna elements should be fashioned out of stiff wire or metal rods. One club member recycled a broken TV antenna and used 19 inch segments of its elements. The schematic shows two antennas; you might be wondering why there are four antenna elements. The extra two are connected to the coax shield at the ends of the boom. These form a counterpoise for the two active elements. The boom of the antenna must be less than 1/2 wavelength long. The longer the boom, ( up to 1/2 wavelenngth ) the more RF phase difference will be detected. I found that spacing the antennas about 1/4 wavelength apart gave the best results. Further apart resulted in more modulation but at the expense of portability. It also seemed a bit less sensitive to multipath errors when I used the shorter boom. The antenna unit pictured here has a 15 inch long boom. The antenna must be constructed as symmetrical as possible. The lengths of coax from the center BNC connector must be identical. A difference of 1/2 inch will cause an error of several degrees. If you use 1/2 wavelengths of coax you only need one set of diodes where the coax connects to the BNC connector at the center of the boom. If you find it easier to mount a flange style SO-239 connector on the boom instead of a BNC, use it instead. You will then need a cable with an PL-259 at one end and a BNC connector at the other to connect the antenna to the RDF unit. I have found that by mounting the antenna on a mast so it is up and in the clear will result in the most accurate bearings. (It is then away from reflections from your body and the ground) Whatever you do, make the unit collapsible so it can be stored when not in use. My antenna unit is designed to fold for storage. Wing nuts are used to secure the elements in position. I used brass brazing rod for the antenna elements on my latest hand-held unit. Earlier units used straightened out coat hanger. On the unit pictured, I used 1/2 wavelength lengths of coax between the center PIN diode and the antenna elements. This allowed me to use only one pair of PIN diodes in the center. I coiled the coax and secured it to the boom mid way between the center BNC connector and the ends. 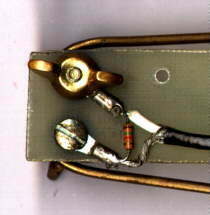 RG-174 coax was used on the unit illustrated here to reduce weight. The resistor in the picture is a 1.5k. The schematic below shows 820 ohms. Remember, in this circuit, few part values are critical. The antenna boom was made from a piece of scrap glass epoxy circuit board material about 15 inches long and about 1 1/4 inch wide. I peeled the copper from the board, mounted a BNC connector at the center, and used small ring terminals secured by screws as tie points.The PIN diodes are the small rectangular black parts with the red stripe at one end. 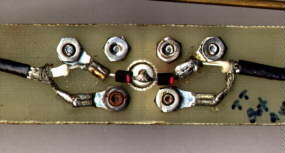 The picture shows them soldered to the back of a chassis mount BNC connector. When you build your antenna make sure you mark one side as being the side towards the transmitter. Also mark the TOP. The first time I used this antenna, I started out walking away from the fox instead of towards it because the antenna was being held upside down. (My antenna was visually as well as physically symetrical) What amazed me was the number of other hunters who followed me thinking I knew where I was going. For the second fox hunt, I had marked the antenna. I won that event using this unit. Copyright 1997 - Joseph Leggio - all rights reserved.